For the last 10 years, our family and one other family head out of town on Tuesday night to spend the Thanksgiving weekend camping. 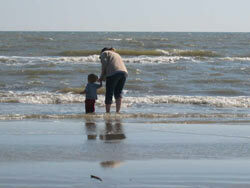 This year we decided on spending it on the beach in Galveston. 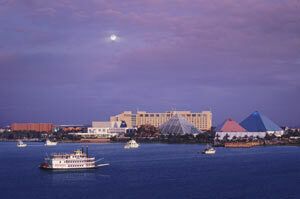 We selected Galveston because of its good weather, beach camping, and lots of fun things to see and do. Since Galveston State Park was full, we stayed at Dellanera Park and RV resort, which is a city owned park about 9 miles from downtown Galveston. 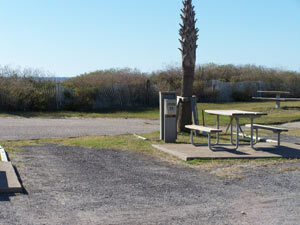 The park sits behind a berm right on the Gulf of Mexico and some of the park amenities include: playground, 79 sites with a combination of water/electric/sewer, a few sites with water/electric only, laundry room, small store, and small play room. 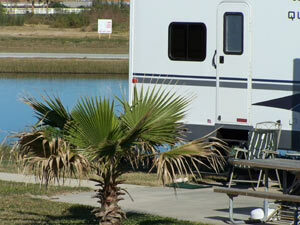 Check out the camping section of Texas Outside for other places to stay in and around Galveston. 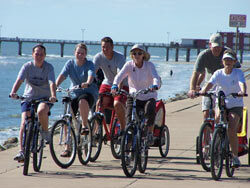 Wednesday morning was spent biking on the beach and over to Galveston Island State Park. Across the street from the State Park campsites is a nature area which we explored by bike for about an hour. 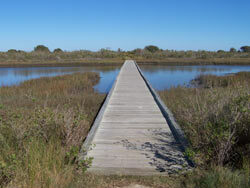 The trails are flat and wind through the grassland and across and around the bayous. The terrain is exactly the same, which gets a little boring after about 25 minutes of riding so we headed back toward the beach and rode through some of the housing developments - there are some unique and magnificent houses along the beach. Then it was back to the beach and home for lunch and some beach time. Beach time includes playing in the water, bocce ball, and kite flying. The wind was too light for the big kites, so we used some cheap kits and had kite wars (last kite flying is the winner) which always gets the juices and giggles flowing. Later that day, I went exploring to check out some of the other fun things to see and do near where we were staying. I first stopped at the Galveston Health and Racquet Club to see if we could play tennis on their great courts or utilize any of the other amenities within this 9,000 square foot facility with basketball, swimming, water slide, aerobics and strength equipment. 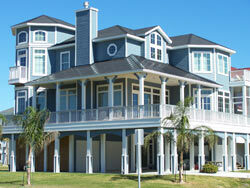 The answer was yes, they have a guest fee for visitors of $35 per week or $12 per day. Down the block from the Health and Racquet Club is the Lone Star Flight Museum. 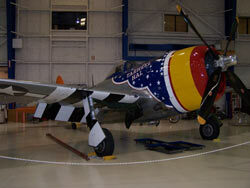 The Lone Star Flight Museum is home to one of the premier flying collections of historic aircraft in the world. 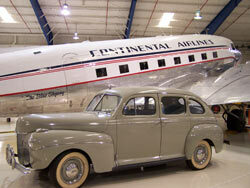 This 100,000 foot facility has aircraft from the 1940's and the displays are very well done. A great place to spend some time if you like aircraft or if it's raining or cold. Across the street from the Flight Museum is one of the newest editions to Galveston, the Schlitterbahn Galveston Island Water Park. What a fun place and it is open year round. During the winter there are more than a dozen heated (84 degrees) waterpark attractions including four tube rides, three speed slides, three kids activity areas, a secluded beach, hot tub, and the tidal wave river. By April 2007 the entire park will have over 32 attractions. Adults and kids of all ages can have a good time at Schlitterbahn -- rain or shine. 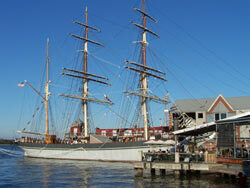 In the summer another side of the park is open and the number of attractions double. 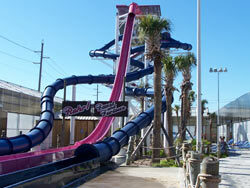 If you would like more information read our review of Schlitterbahn by clicking here. We rated Schlitterbahn an 8.5 on the fun scale. After all that fun exploring I was more than ready for an excellent dinner of Honey Baked Ham and all the fixings. Then the games started - ladder golf , backgammon, dominos, and we ended with the 11 of us playing King Kahuna. Turkey Day was spent close to the campsite so we could watch the game, drink beer, and make sure that the turkey didn't burn. We inject a turkey with an off the shelf jalapeno and garlic injection; season it with lots of Tony Chachere's, pepper and other seasonings; stuff it with dressing; and put it on the weber grill for 5 hours or so adding charcoal and mesquite as needed. Wow, it was excellent! Plus dinner included all the other sides - mashed potatoes, gravy, bean casserole, rolls, relishes, and a magnificent corn casserole. 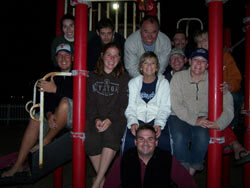 Since we were all too full to move, we just stayed at the picnic table and played games into the wee hours. Friday, we waddled out of the campers and hit the bikes to ride along the seawall to Galveston in search of the perfect beach bar (good music, great view, games, frozen drinks, and low prices!) for pina coladas, margaritas, and a seafood lunch. The seawall runs along the beach for at least 12 miles or so and after 5 miles we started our search for that bar and restaurant. Each local we talked to recommended a place another a few blocks down the seawall and each place they recommended was closed - after all, it was the day after Thanksgiving. After riding what seemed like a 100 miles, we finally ended up at the Poop Deck which met a couple of the perfect beach bar criteria - cheap cold beer, one worn out well used pool table, a good view of the beach, and Jimmy Buffet playing on the juke box inside the bar. We checked out another couple closed seafood restaurants along the seawall and then started heading back toward the campground to an outside restaurant called Caseys. It met two of our other criteria (an outside patio with a view and frozen pina coladas and margaritas) but the waiters were on island time (which means "no big rush, we are on vacation also"), the food was a little pricey, and we rated it just above ok (after 100 miles of bike riding the pina coladas were rated a 10). After all the food and drinks, we all rode slowly along the seawall back to the campground. 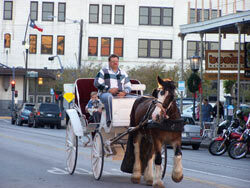 Late Friday afternoon we drove into town and some of our party walked and shopped the Strand. The Strand is fun to visit because of the shops; history, museums, and culture; events and festivals; restaurants and nightlife. The non shoppers biked the Strand, then along the wharf (restaurants, fresh fish markets, and boats along the channel), and through some of the historical district (some very nice restored homes which were built in the late 1800's). The real reason we came downtown was for the lighted boat parade in the channel along the wharf. A festive parade of about 50 boats of all different sizes decorated with Christmas lights, palm trees, Santa's, and some rather inebriated boaters paraded to Christmas music in front of the crowd and judges on the wharf. A unique experience that put a smile on your face, a carol in head, and the Christmas spirit in your heart. Then we headed to Shrimp & Stuff (one of the few places that multiple locals recommended) for some inexpensive and good fried seafood. Then back to the campsite for games and the pie and ice cream that we couldn't eat after the filling Thanksgiving dinner. A full and fun day. 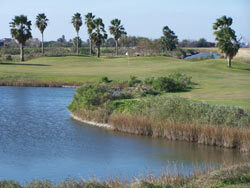 Saturday was golf at Galveston Island Golf Course. The back nine of this course is fun and challenging with lots of water and natural hazards. You can read the review of Galveston Island Golf Course and find other nearby courses in the golf section of Texas Outside. Back at the beach we flew kites and played 10 holes of frisbee golf (make up your own holes - for example, between the two palm trees, up the ramp, and hit the sign without hitting grass or cars which is a one stroke penalty). That evening we had venison cooked three different ways: deep fried, barbequed, and bacon covered and stuffed with jalapenos and garlic - outstanding! Somehow, later that evening we ended up on the playground for some silly games and friendly competition including chin ups, swing bar leg wrestling, group sliding, and more (we are all kids at heart - I hope no other adults or kids were watching these late night antics!). 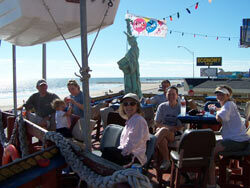 Sunday we broke camp and headed up to Kemah. We rode bikes around town; walked the boardwalk; had drinks, nachos, and margaritas on Cadillac Bar's deck while overlooking the boats coming and going through the channel; feed the sting rays; listened to some of the musicians playing in various parts of the city; and had an early dinner at T-Bone Tom's Steak House (very tasty) and we caught some music on their patio. 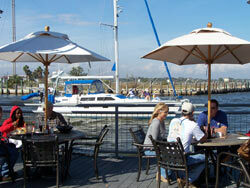 You can read about a previous trip to explore southeast Texas and Kemah by clicking here. 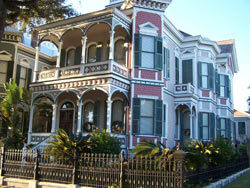 You can also find more fun things to see and do in Galveston or other nearby areas in the Discover Texas Section of Texas Outside. Then our tired and depressed group ('cuz we had to leave) got in the motor homes and headed back to the Big D for another week of work.